Central vacuum systems distinguish themselves from portable vacuums in a number of ways. The most obvious difference between the two configurations is that portable vacuums can be moved while central vacuum systems are entire systems of vacuum cleaning equipment. Central vacuum systems usually involve a single piece of equipment that creates a powerful vacuum for collecting debris. That vacuum leads into an enclosure into which the collected debris is held. The central vacuum is connected to a network of narrow ducts that run out of sight throughout a building, often underneath floors or above ceiling tiles. The ducts feature inlets that are accessible by maintenance staff and allow for the connection of portable hoses and vacuuming wands. Central vacuum systems offer several advantages over backpack, walk-behind, and all other varieties of portable vacuums. Because the actual central vacuum is stationary, its power source can also be stationary. This means that maintenance staff do not have to search for power sources; they need only to connect their vacuuming wands and hoses to the central vacuum system’s inlets. Another advantage over portable vacuums is that because the central vacuum is usually located in a maintenance or mechanical room, it causes less noise disruption than portable vacuums, which can be quite loud. All vacuum cleaners are intended to achieve the same purpose: the effective removal of debris from an area. Central vacuums offer a unique solution to the problem of large building maintenance. Because all of the debris that is collected while vacuuming goes to a central storage area, a minimum investment in filters is required. Also, all hoses and attachments that are used with a given central vacuum system are standardized, cutting down on the number of different materials required to supply janitorial staff with. All portable vacuum cleaners have to be emptied when they become full. This process requires time from janitorial staff and increases the potential to spread dust and debris around during emptying. 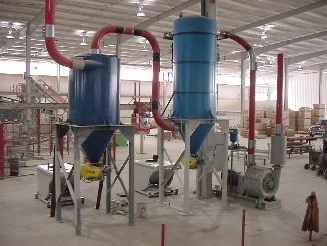 Central vacuums are emptied at regular intervals, which streamlines the waste material removal process. Recent developments in central vacuum system design have also allowed for the inclusion of air filters, which contribute to cleaner air quality. Despite the benefits central vacuum systems offer, they are not ideal in every situation. It can be costly to install the necessary ductwork and equipment in buildings that were not originally built with central vacuum systems. Also, in small buildings, central vacuum systems may be unnecessary. They are most effective in large areas that require frequent maintenance. Central Vacuum Systems Central vacuum systems are industrial vacuum cleaners that are built into the structure of a building in order to allow for easy maintenance.